All That You Can't Leave Behind is the tenth studio album by Irish rock band U2. It was produced by Brian Eno and Daniel Lanois, and was released on 30 October 2000 on Island Records in the United Kingdom and Interscope Records in the United States. Following the mixed reception to their 1997 album, Pop, All That You Can't Leave Behind represented a return to a more mainstream sound for the band after they experimented with alternative rock and dance music in the 1990s. At the time of the album's release, U2 said on several occasions that they were "reapplying for the job ... [of] the best band in the world". U2 brought back Eno and Lanois, who had produced three of the band's previous albums. The album was originally named "U2000", which had been a working title for their PopMart Tour. All That You Can't Leave Behind received favourable reviews from critics and sold over 12 million copies. The songs "Beautiful Day", "Walk On", "Elevation", and "Stuck in a Moment You Can't Get Out Of" were all successful singles. The record and its songs won seven Grammy Awards; it is the only album in history to have multiple tracks win the Grammy Award for Record of the Year: "Beautiful Day" in 2001 and "Walk On" in 2002. In 2003, the album was ranked number 139 on Rolling Stone magazine's list of "The 500 Greatest Albums of All Time", but it was re-ranked at number 280 in 2012. The supporting Elevation Tour, on which the band returned to playing arenas with a more intimate stage design, was also a critical and commercial success. Throughout the 1990s, U2 experimented with alternative rock and electronic dance music, culminating with their 1997 album Pop and the accompanying PopMart Tour. Guitarist The Edge said that with Pop, the band had "taken the deconstruction of the rock 'n' roll band format to its absolute 'nth degree." However, following the poor reception to the album and tour, the band wished to return to song arrangements that consisted almost entirely of guitar, bass, and drums, and to quickly regroup in the studio after the tour. They reunited with producers Brian Eno and Daniel Lanois, who also produced their albums The Unforgettable Fire, The Joshua Tree and Achtung Baby. Although the band wanted to develop new material before beginning to record, Eno convinced them to quickly write songs in the studio. For three weeks in late 1998, U2, Eno, and Lanois recorded demos in Hanover Quay Studios. One of the few quality ideas that stemmed from these brief sessions was the song "Kite". Lead singer Bono's vocals inspired everyone in the studio, particularly after he had been suffering from vocal problems for the previous few years. U2 thought they would have a new record completed in time for 1999. After the band's brief demo sessions, The Edge worked alone on song ideas before the band reunited at Hanover Quays. They recorded with the mentality of a "band in a room playing together", an approach that led to the album's more stripped-down sound. Bono's involvement in the Jubilee 2000 campaign prevented him from dedicating all of his time to the album's recording, something Eno thought was a distraction. There was also a two-month break in the sessions when Bono collaborated with Lanois and Hal Wilner on the Million Dollar Hotel film soundtrack. The band had thought they could complete the album for 1999, but the sessions ran long, with band members' conflicting schedules playing a large part in the delay. U2 did not want to put a deadline on completing the album after their experience with Pop, which had to be rushed to completion into order to meet the deadline set by their pre-booked PopMart Tour. In the summer of 1999, bassist Adam Clayton and drummer Larry Mullen, Jr. bought houses in the South of France, in order to be near Bono and The Edge's homes so they could have a place to both "work and play". That year, a bag holding personal papers and a laptop computer containing lyrics for the album was taken from Bono's car, which was parked outside Dublin's Clarence Hotel, which is owned by Bono and The Edge. Bono offered a reward of £2,000 for the return of the computer. An Irish man returned the laptop after having bought it for £300 thinking it was from a reputable source. He realized it was Bono's when he saw a picture of the singer's child Elijah Bob on the screen, prompting him to contact U2's management. The band have said that All That You Can't Leave Behind was an album that acknowledged the band's past. For example, there was a big debate amongst the band members during the writing and recording of "Beautiful Day"; The Edge was playing with a guitar tone that he had not used much since their 1983 album War and the band wanted something more forward-looking. The Edge won out and the tone made it into the final studio version of the song. Additionally, although the record was described as "a return to the traditional U2 sound", many songs were complex and retained elements of the band's 1990s experimenting; "Beautiful Day" features an electronic drum beat, and the song's intro features an "electronification of the [chorus] chords with a beat box and a string part"; "New York" came together when the band members were away at a meeting and Lanois and Eno were playing around with a drum loop that Mullen had recorded. The album's recording wrapped up in 2000. The album was seen as a return to the band's traditional sound after their more experimental records of the 1990s. In many ways, however, this is an oversimplification, as the album breaks new ground by retaining the sonic nuances of their 1990s work and reconciling it with the melodic, hook-filled rock of their 1980s work. The first song (and lead single), "Beautiful Day," for instance, is an optimistic anthem that opens with a drum machine and a rhythm sequencer. The album also includes "Stuck in a Moment You Can't Get Out Of," a song written by Bono for his friend, lead singer of INXS, Michael Hutchence, who committed suicide in 1997. The album is banned in Burma by SPDC because "Walk On" is a song that was dedicated to Burmese human rights activist Aung San Suu Kyi. Following the comparatively poor reception of their previous album Pop, U2 declared on a number of occasions that they were "re-applying for the job ... of best band in the world." Promotional activities for the album included a number of U2 firsts such as appearances on MTV's Total Request Live, USA Network's Farm Club, and Saturday Night Live. The band kicked off the release of the album by performing a short concert for about 600 people at the ManRay club in Paris, France, on 19 October 2000, as part of the promotion for the 30 October release of the album. The album was preceded by the lead single "Beautiful Day", released on 9 October 2000. It was U2's fourth #1 single in the UK, their first #1 in the Netherlands, and was also #1 for a week in Australia. The song peaked at #21 in the US. The album's second single, "Stuck in a Moment You Can't Get Out Of", was originally released 29 January 2001. It was also a success, reaching #2 on the UK Singles Chart. A third single, "Elevation", was released 12 June 2001. The version of the song released as the single was the "Tomb Raider Mix", which appeared in television commercials for the Lara Croft: Tomb Raider movie. It featured a much more hard rock arrangement than the album version, and it is this arrangement that the band plays live. The album's fourth and final single, "Walk On" was released on 19 November 2001. The song was originally written about and dedicated to Aung San Suu Kyi, but the song took on new meaning with listeners following the September 11 attacks. The photograph on the album cover was taken by long-time U2 photographer Anton Corbijn in the Roissy Hall 2F of the Charles de Gaulle Airport in Paris, France. Unlike the busy colour sleeves of the band's 1990s records, the cover is a single monochrome image of the band in the airport's departure terminal. The designers describe the look they created as "grown up". Early versions of the cover released to the press show a departure sign that reads "F21-36", however, this was changed to J33-3 in reference to the Bible verse Jeremiah 33:3, "Call unto me and I will answer thee great and mighty things which thou knowest not." Bono referred to it as "God's phone number" The lyric "3:33 when the numbers fell off the clock face" appears on the song "Unknown Caller" from the group's 2009 album No Line on the Horizon. "All That You Can't Leave Behind is easy to relate to, full of solid songs that appeal to a wide audience with its clear notions of family, friendship, love, death, and re-birth. ...the sounds on this album come from a band that has digested the music it started to consume while making Rattle and Hum. This time they are neither imitating or paying tribute. This time it's soul music, not music about soul." All That You Can't Leave Behind received favorable reviews from critics; at Metacritic, which assigns a normalized rating out of 100 to reviews from mainstream critics, the album received an average score of 79, based on 17 reviews. Many critics, such as Rolling Stone magazine, declared it as "U2's third masterpiece", alongside The Joshua Tree and Achtung Baby. Steve Morse of The Boston Globe said the record "has great songs that tie together beautifully—a welcome change from the disjointed nature of U2 discs such as 1993's Zooropa and 1997's Pop". He believed that Bono took extra care in crafting the lyrics, resulting in the "most thoughtful, personal, and tender U2 songs in memory". In his review for The Village Voice, Robert Christgau felt that the album eschewed the artsier tendencies of U2's previous work in favor of hooky pop songs and stated, "The feat's offhandedness is its most salient charm and nagging limitation. If I know anything, which with this band I never have, their best." AllMusic editor Stephen Thomas Erlewine noted U2's return to "the generous spirit that flowed through their best '80s records" and called All That You Can't Leave Behind "a clever and craftsmanlike record, filled with nifty twists in the arrangements, small sonic details, and colors." USA Today's Edna Gundersen wrote that the band had distilled their previous experimentation "into smart accents and muted afterthoughts", resulting in a more organic record driven by "simplicity and soul", and The Guardian's Adam Sweeting felt that they had "grasped the value of simplicity" and created their most accessible and emotional recording since Achtung Baby. While remarking that the record's streamlined nature rendered it "a teensy bit dull", April Long of NME nevertheless called All That You Can't Leave Behind "a laudable achievement". Stephen Thompson was less enthusiastic in his review for The A.V. Club and found it inconsistent: "In terms of execution, it splits about 50–50 between soaring hits and dispiriting misses." At the end of 2000, All That You Can't Leave Behind was voted the seventh-best album of the year in the Pazz & Jop annual critics poll published by The Village Voice. "Beautiful Day" finished fourth in the singles voting. The album and its singles earned U2 seven Grammy Awards over the course of two years. At the 43rd Annual Grammy Awards in 2001, "Beautiful Day" won Song of the Year, Best Rock Performance by a Duo or Group with Vocal, and Record of the Year. In the 44th Annual Grammy Awards in 2002, "Walk On" won Record of the Year, "Elevation" won Best Rock Performance by a Duo or Group with Vocal, and "Stuck in a Moment You Can't Get Out Of" won Best Pop Performance by a Duo or Group with Vocal. The album also won Best Rock Album that year. All That You Can't Leave Behind is the only album ever to have two singles win Record of the Year in two consecutive years. In 2012, All That You Can't Leave Behind was ranked number 280 on Rolling Stone magazine's list of "The 500 Greatest Albums of All Time". In 2009, it was ranked by Rolling Stone as the 13th-best album of the decade, while "Beautiful Day" was rated the ninth-best song. The album was also included in the book 1001 Albums You Must Hear Before You Die. The album debuted at number three on the Billboard 200 chart in the US, selling 427,826 copies in its first week. The album debuted at number one in 32 countries, including Canada where first-week sales totaled 71,470 copies. According to Nielsen SoundScan, the album has sold 4.4 million copies in the US through March 2014. All That You Can't Leave Behind is the fourth-highest-selling U2 album, with total sales of over 12 million. The accompanying Elevation Tour officially began on 24 March 2001 with a two-night stay at the National Car Rental Center near Fort Lauderdale, Florida, and ended back in Miami, Florida on 2 December 2001 at the American Airlines Arena. The tour featured three legs and a total of 113 shows. The Elevation Tour saw U2 return to playing indoor arenas after they spent the 1990s in outdoor stadiums. The stage design of the Elevation Tour was more stripped-down and intimate for the fans. The tour grossed approximately US$110 million, and was at the time the third highest-grossing tour of all time by Pollstar, with many of the stops selling out immediately. The band performed multiple shows in the same location including four consecutive shows in Chicago, Boston and London, respectively. The song "Beautiful Day", which debuted on the tour, is one of only two U2 songs to have been played at every concert since their introduction (the other being "Vertigo"). All lyrics written by Bono except where noted; all music composed by U2. 2. "Stuck in a Moment You Can't Get Out Of"
6. "In a Little While"
9. "When I Look at the World"
In Japan, Australia, Ireland and the UK, "The Ground Beneath Her Feet" (3:44) is a bonus track at the end. Various limited edition copies included a bonus disc with either "Always," "Summer Rain," or "Big Girls are Best". The 7 (EP) was subsequently released in the U.S., collecting these B-sides previously unavailable in that region. Adapted from the liner notes. 1 2 Tyrangiel, Josh (23 February 2002). "Bono's Mission". Time. Retrieved 10 March 2007. ↑ "TOP 500 ALBUMS OF ALL TIME". Retrieved 5 January 2013. ↑ "All That You Can't Leave Behind". The 500 Greatest Albums of All Time. Rolling Stone. Retrieved 5 January 2013. ↑ Quinn, Ben (16 July 2004). "French police still haven't found what U2's looking for". Irish Independent. Retrieved 5 July 2013. ↑ "U2's Criminal Record". NME. 24 November 2000. Retrieved 12 August 2011. ↑ "U2 Paris, 2000-10-19, Manray Club, All That You Can't Leave Behind Promo". U2Gigs. Archived from the original on 28 August 2008. Retrieved 12 August 2011. ↑ Lang, Nico (18 September 2014). "How U2 became the most hated band in America". Salon. Salon Media Group. Retrieved 18 September 2014. 1 2 "Reviews for All That You Can't Leave Behind by U2". Metacritic. CBS Interactive. Retrieved 10 March 2014. 1 2 Erlewine, Stephen Thomas. "All That You Can't Leave Behind – U2". AllMusic. All Media Network. Retrieved 28 December 2010. ↑ DeRogatis, Jim (31 October 2000). "Yes, U2 can go home again". Chicago Sun-Times. ↑ Browne, David (3 November 2000). "All That You Can't Leave Behind". Entertainment Weekly (567). Retrieved 28 December 2010. 1 2 Sweeting, Adam (27 October 2000). "Pop CD of the Week: Time to get the leathers out". The Guardian. London. Retrieved 28 December 2010. 1 2 Long, April (28 October 2000). "Even Better Than the Surreal Thing!". NME. Retrieved 28 December 2010. ↑ DiCrescenzo, Brent (31 October 2000). "U2: All That You Can't Leave Behind". Pitchfork Media. Retrieved 17 August 2011. ↑ Blake, Mark (December 2000). "U2: All That You Can't Leave Behind". Q (171): 116–17. 1 2 Hunter, James (26 October 2000). "Music Reviews: All That You Can't Leave Behind". Rolling Stone (852). Retrieved 28 December 2010. 1 2 Gundersen, Edna (30 October 2000). "10th album: A beautiful day for us all". USA Today. Retrieved 3 October 2016. (subscription required (help)). 1 2 Christgau, Robert (28 November 2000). "Getting Bizzy". The Village Voice. New York. Retrieved 2 September 2014. ↑ Morse, Steve (26 October 2000). "U2 leaves the present behind". The Boston Globe. Retrieved 28 December 2010. ↑ "The 2000 Pazz & Jop Critics Poll". The Village Voice. New York. 20 February 2001. Retrieved 30 July 2015. ↑ Gallo, Phil (28 February 2002). "The Grammys: U2 and sharp keys; Soul star, Bono tops with 'O Bro'". Variety. ↑ Wenner, Jann S. (ed.) (2012). "The 500 Greatest Albums of All Time". Rolling Stone (Special Collectors Issue). ISBN 978-7-09-893419-6. Retrieved 17 October 2014. ↑ "100 Best Albums of the Decade". Rolling Stone. 9 December 2009. Archived from the original on 13 December 2009. Retrieved 17 October 2014. ↑ "100 Best Songs of the Decade". Rolling Stone. 9 December 2009. Archived from the original on 13 December 2009. Retrieved 17 October 2014. ↑ Robert Dimery; Michael Lydon (23 March 2010). 1001 Albums You Must Hear Before You Die: Revised and Updated Edition. Universe. ISBN 978-0-7893-2074-2. 1 2 "U2 debuts at #1 in Canada". Jam!. Retrieved 13 June 2013. ↑ Hampp, Andrew; Halperin, Shirley (7 March 2014). "No U2 Album, Tour Until 2015 (Exclusive)". Billboard.com. Prometheus Global Media. Retrieved 7 March 2014. 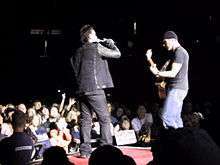 ↑ "U2 Elevation Tour 1st leg: North America". U2Gigs. Retrieved 12 August 2011. ↑ "U2 Elevation Tour 3rd leg: North America". U2Gigs. Retrieved 12 August 2011. ↑ "U2 Tour overview". U2Gigs. Retrieved 12 August 2011. ↑ Gundersen, Edna (23 January 2005). "U2 tour has the concert business getting dizzy". USA Today. Retrieved 12 August 2011. ↑ All That You Can't Leave Behind (CD booklet). U2. Interscope Records. 2000. ↑ "Australiancharts.com – U2 – All That You Can't Leave Behind". Hung Medien. Retrieved 6 June 2014. ↑ "Austriancharts.at – U2 – All That You Can't Leave Behind" (in German). Hung Medien. Retrieved 6 June 2014. ↑ "Ultratop.be – U2 – All That You Can't Leave Behind" (in Dutch). Hung Medien. Retrieved 6 June 2014. ↑ "Ultratop.be – U2 – All That You Can't Leave Behind" (in French). Hung Medien. Retrieved 6 June 2014. ↑ "U2 – Chart history" Billboard Canadian Albums Chart for U2. Retrieved 6 June 2014. ↑ "Danishcharts.com – U2 – All That You Can't Leave Behind". Hung Medien. Retrieved 6 June 2014. ↑ "Dutchcharts.nl – U2 – All That You Can't Leave Behind" (in Dutch). Hung Medien. Retrieved 6 June 2014. ↑ "U2: All That You Can't Leave Behind" (in Finnish). Musiikkituottajat – IFPI Finland. Retrieved 6 June 2014. ↑ "Lescharts.com – U2 – All That You Can't Leave Behind". Hung Medien. Retrieved 6 June 2014. ↑ "Officialcharts.de – U2 – All That You Can't Leave Behind". GfK Entertainment Charts. Retrieved 6 June 2014. ↑ "GFK Chart-Track Albums: Week 44, 2000". Chart-Track. IRMA. Retrieved 6 June 2014. 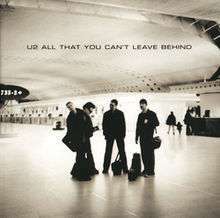 ↑ "Italiancharts.com – U2 – All That You Can't Leave Behind". Hung Medien. Retrieved 6 June 2014. ↑ "Charts.org.nz – U2 – All That You Can't Leave Behind". Hung Medien. Retrieved 6 June 2014. ↑ "Norwegiancharts.com – U2 – All That You Can't Leave Behind". Hung Medien. Retrieved 6 June 2014. ↑ "Oficjalna lista sprzedaży :: OLIS - Official Retail Sales Chart". OLiS. Polish Society of the Phonographic Industry. Retrieved 6 June 2014. ↑ "Spanishcharts.com – U2 – All That You Can't Leave Behind". Hung Medien. Retrieved 6 June 2014. ↑ "Swedishcharts.com – U2 – All That You Can't Leave Behind". Hung Medien. Retrieved 6 June 2014. ↑ "Swisscharts.com – U2 – All That You Can't Leave Behind". Hung Medien. Retrieved 6 June 2014. ↑ "Official Albums Chart Top 100". Official Charts Company. Retrieved 6 June 2014. ↑ "U2 – Chart history" Billboard 200 for U2. Retrieved 6 June 2014. 1 2 "Gold & Platinum". IFPI Austria (in German). International Federation of the Phonographic Industry. Archived from the original on 23 July 2011. Retrieved 12 August 2011. Note: U2 must be searched manually. ↑ "ARIA Charts — Accreditations - 2014 Albums". Australian Recording Industry Association. Retrieved 2 June 2014. ↑ "CAPIF - Representando a la Industria Argentina de la Música". archive.is. 31 May 2011. Retrieved 13 November 2016. 1 2 "Gold and Platinum Search: All That You Can't Leave Behind". Music Canada. Retrieved 29 August 2011. ↑ "Album Top-40: Uge 18- 2002". Hitlisten (in Danish). IFPI Denmark. Archived from the original on 29 September 2007. Retrieved 12 August 2011. 1 2 "IFPI Platinum Europe Awards – 2002". International Federation of the Phonographic Industry. 1 2 "Kulta — ja platinalevyt" (in Finnish). IFPI Finland. Archived from the original on 17 August 2010. Retrieved 21 September 2010. ↑ "Goud/Platina" (in Dutch). NVPI. Archived from the original on 18 January 2010. Retrieved 9 January 2011. ↑ "Listy bestsellerow, wyroznienia — Złote CD" (in Polish). Polish Society of the Phonographic Industry. Archived from the original on 21 July 2011. Retrieved 12 August 2011. ↑ "Listy bestsellerow, wyroznienia — Pełny Tekst Regulaminu Przyznawania Wyróżnień" (in Polish). Polish Society of the Phonographic Industry. Archived from the original on 21 July 2011. Retrieved 12 August 2011. ↑ "Certifications – Search for: All That You Can't Leave Behind". The Official Swiss Charts. Hung Medien. Retrieved 12 August 2011. 1 2 "Certified Awards Search". British Phonographic Industry. Archived from the original on 24 September 2009. Retrieved 25 November 2009. Note: U2 must be searched manually. ↑ "Gold & Platinum – Searchable Database". Recording Industry Association of America. Retrieved 26 April 2011. Note: U2 must be searched manually. ↑ "Gold & Platinum – Certification Criteria". Recording Industry Association of America. Archived from the original on 29 June 2011. Retrieved 12 August 2011. Graham, Bill; van Oosten de Boer, Caroline (2004). U2: The Complete Guide to Their Music. London: Omnibus Press. ISBN 0-7119-9886-8. McGee, Matt (2008). U2: A Diary. London: Omnibus Press. ISBN 978-1-84772-108-2.